Everything in moderation, if you can manage that then you already have the building blocks to a healthy and balanced diet. Some of us; me, have always struggled with moderation, especially deep fried processed foods. There is actually a reason you keep wanting more of the bad stuff (processed foods) and this has a lot to do with your bodies reaction to foods high in sugar, salt, and fat. Basically, cravings are due to endorphins that are released into the body after someone has eaten, which mirrors an addiction, and we all know by now that you can actually be addicted to sugar. Start weaning yourself off of sugars and processed foods and you’ll find your cravings and taste buds change. You also learn to be more in tune with your body and start listening and deciphering what it actually wants. 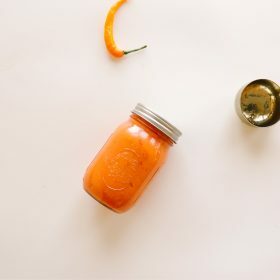 Craving french fries; you’re most likely lacking in sodium and can opt for a healthier choice that will fill that gap. It’s all about finding that right balance for you. And I’m a firm believer in balance over exclusion. 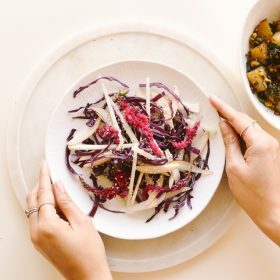 No food group should be completely cut from your diet simply because media trends have deemed it “bad” no whole food is inherently bad for you, and no other vegetable has received it quite as bad as my much-beloved spud; the potato. 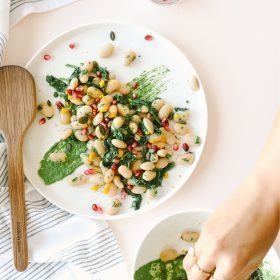 Potatoes are a versatile root vegetable that actually has an incredible wealth of benefits including; large amounts of vitamin C and B-complex, as well as minerals like potassium, magnesium, phosphorus, and zinc. 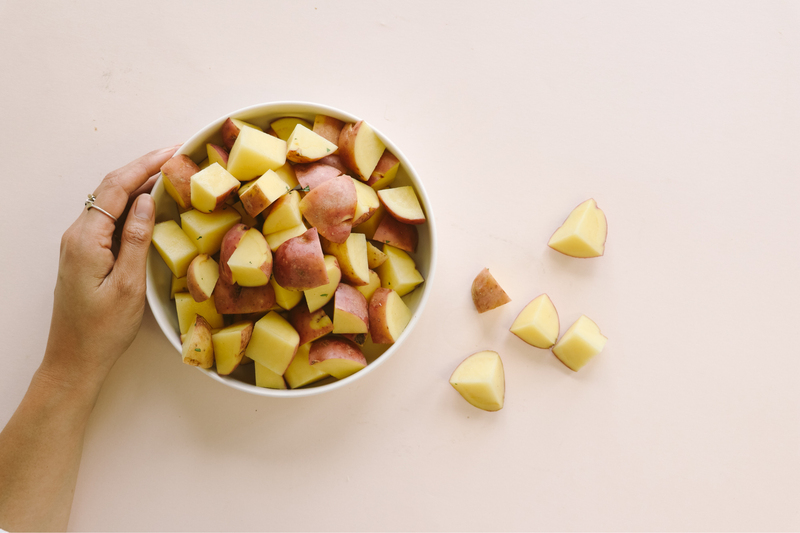 What we do need to remember though is that majority of the nutrients is found in the skin of the potato, so make sure you’re keeping that as part of your meal. 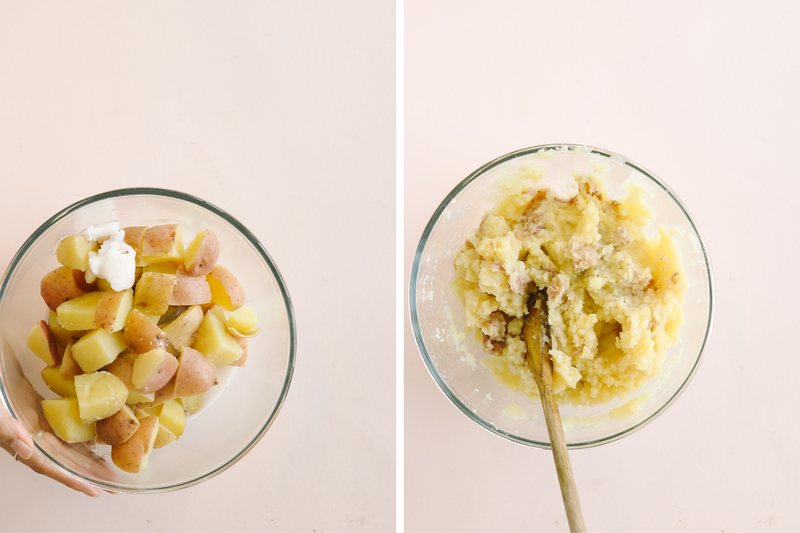 I have quite strong feelings on the misconceptions of potatoes but you can read more about that in our Sweet Potato Boats post. My little spud friends may be the hero of this dish, but truffles make a pretty good sidekick. The flavour of a truffle is one I find incredibly difficult to describe but know that it’s firmly placed in the umami category. I often find myself saying “it just tastes like truffles” which is never a bad thing. But it’s a unique fungus that’s often referred to as the diamond of the kitchen. You’ll most likely find black truffles growing in the shadows of hazelnut and oak trees and are often sniffed out by trained dogs or pigs (truffle hogs). Located through the natural aroma they release when they interact with certain plants, mammals, and insects, these interactions also encourage new colonies of the truffle fungus to appear through spore dispersal. This painstaking process is, in part, what makes truffles so sought after and expensive. However, if you can’t afford the whole lumpy, potato looking truffle you can easily get your fix through truffle salt, or oil. For this recipe, we’ve opted for the salt. 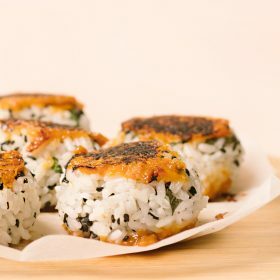 We created the perfect balance of flavours and vegetables. Starting with a potato as our base, they’re so adaptive and versatile that finding the right combination of flavours wasn’t too difficult. Truffles have that incredible subtle earthy flavour, while bringing a rich aromatic burst to your dish. 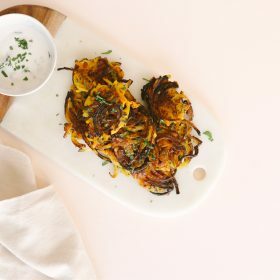 Making sure we kept our potato skins for nutritional value, we add kale, onions, herbs and truffle salt and everything just came together. 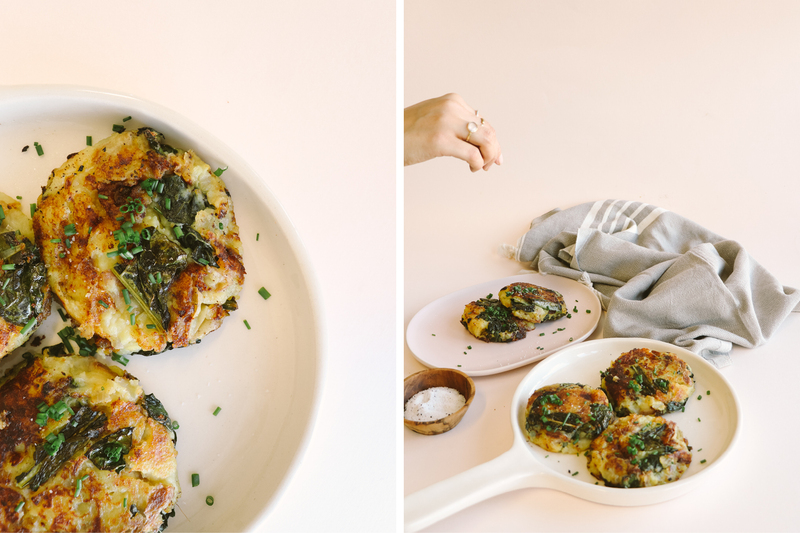 These truffle-infused potato cakes make the perfect side dish to a high protein main course. 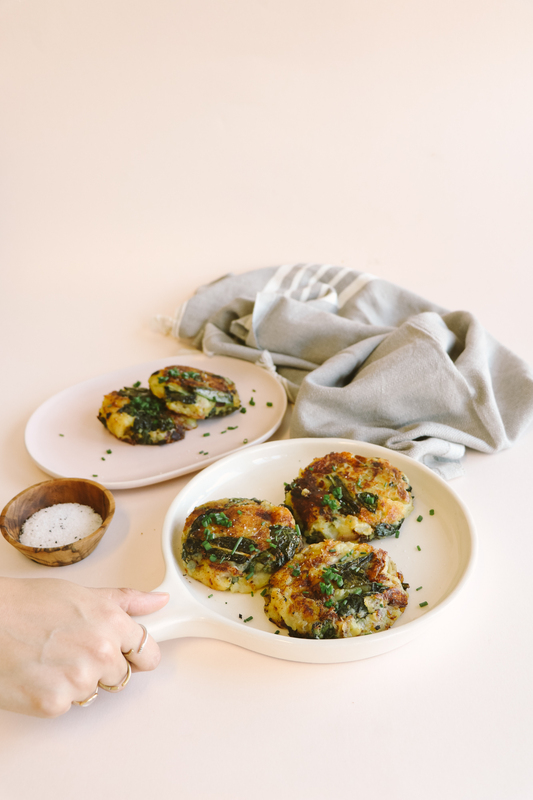 The perfect balance of greens, starch and umami flavours these potato cakes are getting made now and all the way through the festive season. The holiday season is fast approaching and we’re so incredibly excited to share all we have planned with you. Think sparkles, light summer flavours but still nostalgic and warming. Remember that poll we did a week ago, on what flavours you associate with Christmas, we listened and have some amazing recipes to share just in time for your Christmas feast. Place a large pot of water on high heat and bring to a rolling boil. Add a sprinkle of sea salt and add your cubed potatoes. While your potatoes are boiling, sauteé your onions and garlic in a tablespoon of coconut oil until brown and golden. 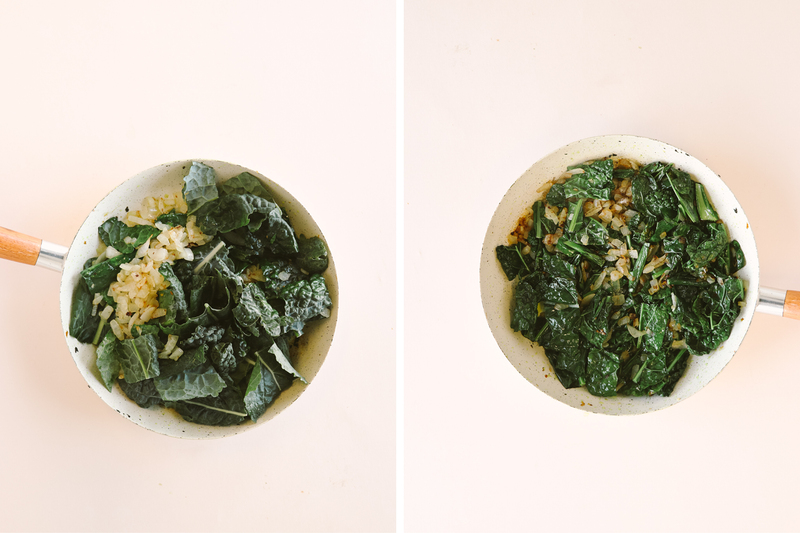 Once your onions have softened, add your chopped kale and sauteé until wilted. Add a squeeze of lemon juice to help the kale soften if needed. 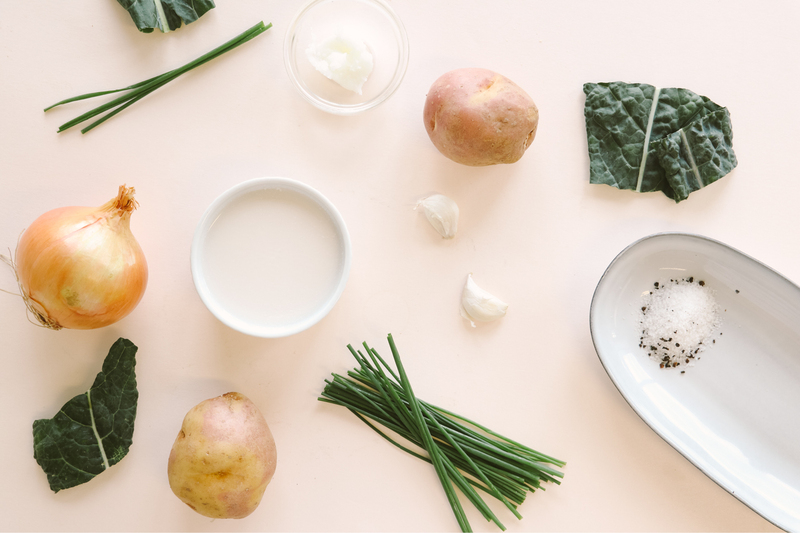 Add your cubed potatoes to a mixing bowl along with your almond milk, a tablespoon of coconut oil, half your truffle salt and sea salt; use a potato masher to combine. The consistency should be quite fluffy. 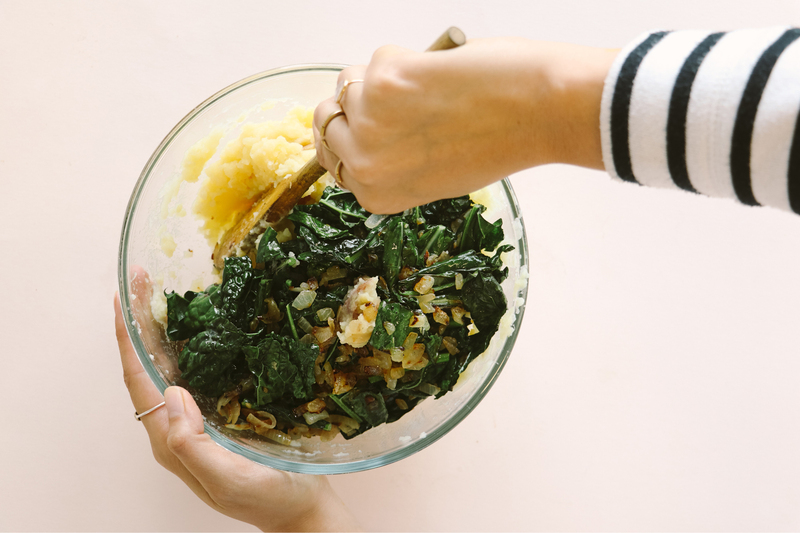 Add your kale, onions and garlic and use a wooden spoon to combine and stir through. 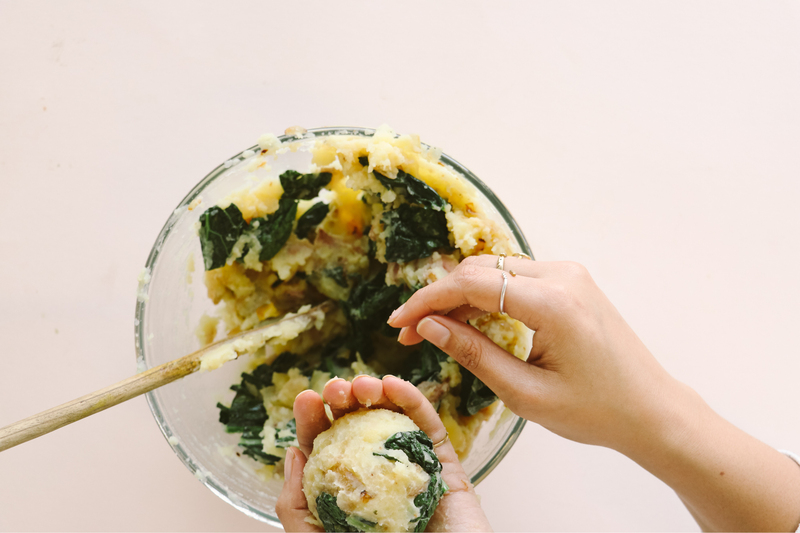 Use a tablespoon to form small balls of potato mixture in your hands, and flatten into little cakes. Place the pan you used for sauteéing your onions back over the medium heat, add coconut oil and once melted lower the heat to a medium/low. 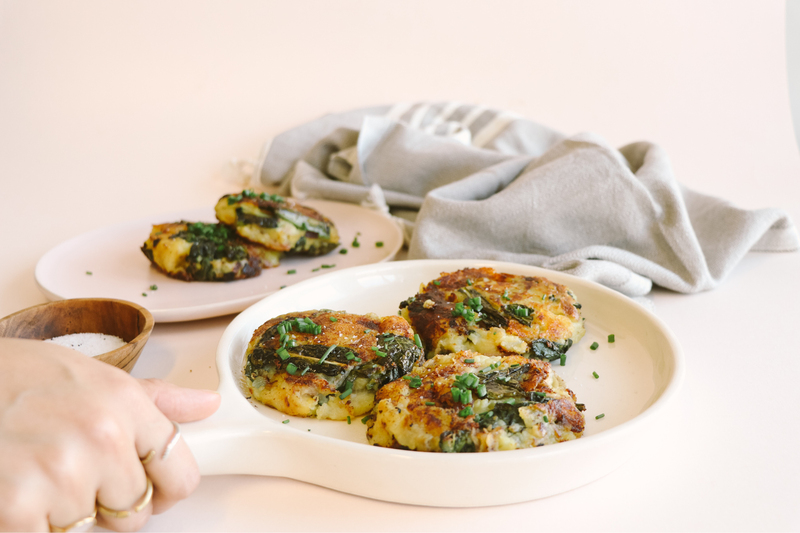 place your potato cakes in the pan, making sure they do not touch and fry for 3 minutes per side, or until they're golden brown and crispy. Remove from pan and garnish with chives, an extra squeeze of lemon juice and any leftover truffle salt.